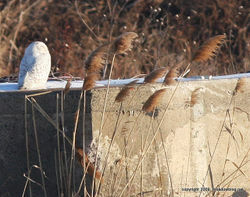 Audubon Magazine's blog, The Perch, has a nice post on the Snowy Owls that have been appearing in spots like the Meadowlands where they are infrequent fliers. "Do not disturb a sleeping owl, or chase it to get a better view or a photograph. This can be extremely harmful to owls, many of which are already stressed from their arduous journeys to unknown territories." Now that the tidal impoundments at DeKorte Park have thawed a bit, we are getting a nice variety of ducks again. Above, a Eurasian ( or common) Green-winged Teal hangs ou t with his more-often seen cousin. A check of the impoundments on Monday afternoon found Black Ducks, Canvasbacks (with that female Ringneck thrown in), Hooded Mergansers (right), Red-breasted Megs, a Northern shoveler and the usual Mallards. 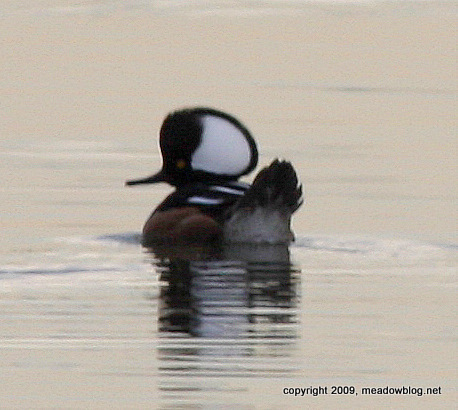 Birder Linda Gangi reports that quite a few Pintails and Buffleheads were around on Monday morning as well. She also reports seeing two male Eurasian/common Green-winged Teal. 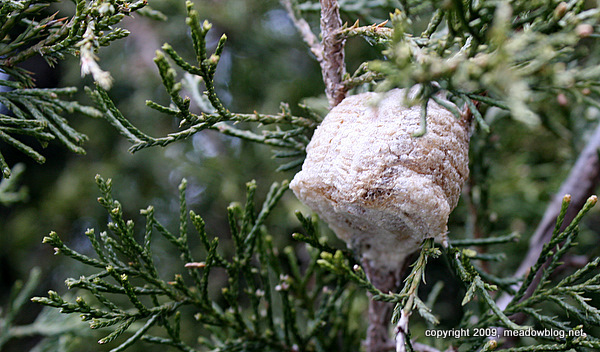 A sharp-eyed NJMC naturalist saw this on a juniper tree in Harrier Meadow last week. Do you know what it is?